How Many Pregnant Women Abuse Substances? Pregnancy can be a wondrous time of life—a time when women become more focused on their own health to promote the health of their unborn baby. They may start to become more aware of what they’re putting into their bodies and how that may affect the child they’re carrying. However, if the mother is addicted to a substance, they may have many questions. Is help available and truly safe? What will it entail? Is it possible to get free from the grip of the addicting substance without harming the baby? How does one learn to live sober? Help is available for pregnant women who struggle with substance abuse. More rehab programs have begun to incorporate services for women who are pregnant. However, only about a quarter of programs nationwide offer these services. Many factors play into the risks associated with using substances while pregnant. These include the specific substance(s) being used, how much the substance is used, and at what point in the pregnancy the substance was introduced. Heart defects: Drinking alcohol and taking certain drugs during pregnancy can result in heart defects, particularly septal defects (a hole in the heart). The majority of infants born with heart defects die within the first year of life. Infections, including hepatitis C and HIV: These viruses are often transmitted by people who share needles during injection drug use. Viruses can then be passed on to the unborn baby during pregnancy or at birth. Neonatal abstinence syndrome (NAS): This syndrome can occur when a baby is born to a mother addicted to a substance (most commonly, opioids) and develops withdrawal symptoms after birth. Fetal alcohol spectrum disorders (FASDs): These disorders are associated with a range of cognitive and developmental difficulties and usually last for life. The sooner a woman can find help and stop using substances, the better chance her baby has at being born full-term without complications. Between 2011 and 2013, 1 in 10 pregnant women reported alcohol use and 1 in 33 reported binge drinking. 9% of pregnant women used illegal drugs. During the detox period, other recovery resources may be incorporated to help pregnant women learn to live drug-free lives. While detox and medical stabilization are critical, they do not constitute drug addiction treatment on their own. Detox should be followed by comprehensive therapy to address the causes that led to substance abuse. If you’re a pregnant woman looking for help, choose a center that is well-versed in treating women who are pregnant. Pregnancy necessitates specialized treatment during both detox and addiction treatment. Not all centers are equipped to help women who are pregnant, so it’s important to confirm this area of expertise before enrolling in a particular program. Staff with medical, mental health, and addiction treatment backgrounds. As discussed above, there are some risks in going through detox while pregnant, such as miscarriage and infant withdrawal symptoms from opioid replacement medications such as methadone and buprenorphine. These are all legitimate concerns that can be addressed with an intake specialist at a treatment center. If the rehab center is geared toward working with pregnant women, staff members will understand these concerns and be able to alleviate anxiety about taking the next step toward a healthier life. In weighing options, it’s important to consider what would happen if one does not get help. The risks to an unborn fetus are high, not to mention the consequences to the mother if substance abuse continues. Addiction only grows without intervention, as do the harsh realities that accompany addiction. New life is a time for celebration as is each day of sobriety. Pregnant women can enjoy this fresh journey in life with newfound sobriety and continued recovery. Help is available. Comprehensive care, along with a nurturing and encouraging environment, offer the baby and mother the best chances for full recovery.
. National Institute on Drug Abuse. (2018). Substance Use While Pregnant and Breastfeeding.
. Forray, A. (2016). Substance use during pregnancy. F1000 Research, 5: F1000 Faculty Rev-887.
. American Pregnancy Association. (2018). Congenital Heart Defects.
. March of Dimes. (2016). Street Drugs and Pregnancy.
. March of Dimes. (2016). 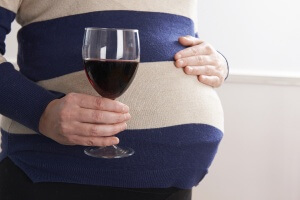 Alcohol During Pregnancy.
. Children’s Hospital of Wisconsin. Teratogens.
. National Organization on Fetal Alcohol Syndrome. Key Facts on Alcohol and Pregnancy.
. Roberts, S. Strategies for engaging pregnant women who use alcohol and/or drugs in prenatal care. Contra Costa Health Services.
. Centers for Disease Control and Prevention. (2018). Fetal Alcohol Spectrum Disorders (FASDs): Data & Statistics.
. Federal Bureau of Prisons. (2018). Detoxification of Clinically Dependent Inmates.
. Bishop, B. et al. (2017). Pregnant Women and Substance Use. Jacobs Institute of Women’s Health.
. National Institute on Drug Abuse. (2018). What are the unique needs of pregnant women with substance use disorders?
. Heberlein, A., Leggio, L., Stichtenoth, D., and Thomas, H. (2016). The Treatment of Alcohol and Opioid Dependence in Pregnant Women. Current Opinion in Psychiatry, 25(6), 559-564.
. Substance Abuse and Mental Health Services Administration. (2017). 2017 State Profile—United States and Other Jurisdictions, National Survey of Substance Abuse Treatment Services (N-SSATS).
. Tuchman, E. (2010). Women and Addiction: The Importance of Gender Issues in Substance Abuse Research. Journal of Addictive Diseases, 29(2), 127-138.
. Forman, R., and Nagy, P. (2006). Substance Abuse: Clinical Issues in Intensive Outpatient Treatment. Substance Abuse and Mental Health Services Administration.
. Little, B.B. et al. (2003). Treatment of substance abuse during pregnancy and infant outcome. American Journal of Perinatology, 20(5), 255-262.
. Substance Abuse and Mental Health Services Administration. (2014). Methadone Treatment for Pregnant Women.